Going for a position as a pharmaceutical sales rep? 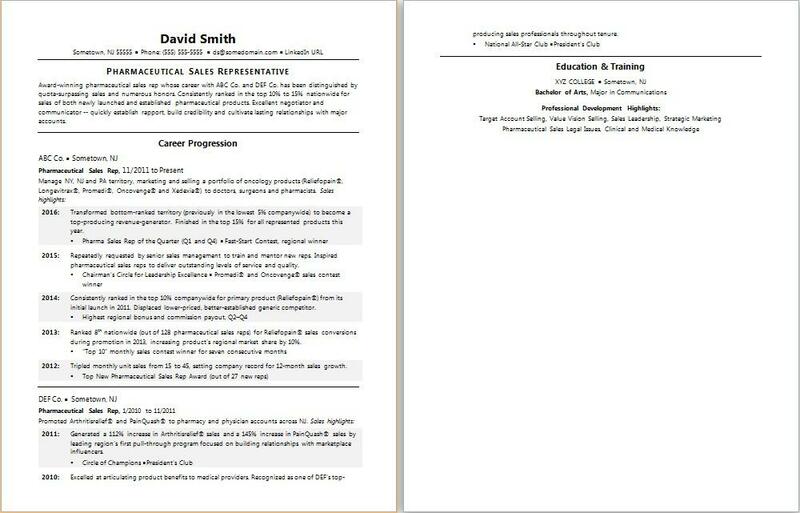 This sample resume shows how you can highlight your pharma sales achievements. Jobs in this field are projected to grow by 5% (or 94,100 jobs) from 2016 through 2026, according to the Bureau of Labor Statistics (BLS). You'll find the highest level of employment for pharma sales reps in the following states: California, Texas, Florida, Massachusetts, and Ohio; and in the following metropolitan areas: Boston, Austin, Los Angeles, Atlanta, and New York City. As a pharma sales rep, you can expect to earn a median wage of $60,340 per year, or $29.01 per hour, according to the BLS. Additionally, you can learn about sales careers and search for pharmaceutical sales jobs on Monster. Award-winning pharmaceutical sales rep whose career with ABC Co. and DEF Co. has been distinguished by quota-surpassing sales and numerous honors. Consistently ranked in the top 10% to 15% nationwide for sales of both newly launched and established pharmaceutical products. Excellent negotiator and communicator -- quickly establish rapport, build credibility and cultivate lasting relationships with major accounts. Transformed bottom-ranked territory (previously in the lowest 5% companywide) to become a top-producing revenue-generator. Finished in the top 15% for all represented products this year. Repeatedly requested by senior sales management to train and mentor new reps. Inspired pharmaceutical sales reps to deliver outstanding levels of service and quality. Consistently ranked in the top 10% companywide for primary product (Reliefopain®) from its initial launch in 2011. Displaced lower-priced, better-established generic competitor. Ranked 8th nationwide (out of 128 pharmaceutical sales reps) for Reliefopain® sales conversions during promotion in 2013, increasing product’s regional market share by 10%. Tripled monthly unit sales from 15 to 45, setting company record for 12-month sales growth. Generated a 112% increase in Arthritisrelief® sales and a 145% increase in PainQuash® sales by leading region’s first pull-through program focused on building relationships with marketplace influencers. Excelled at articulating product benefits to medical providers. Recognized as one of DEF’s top-producing sales professionals throughout tenure.